Fort Worth city planners are using data from an activity tracking app to help inform the design of local foot and bike paths. Biking around Dallas and living to tell the tale is no small feat. Bumper-to-bumper traffic, distracted drivers, constant construction and general inaccessibility create a perfect storm only few can brave. But efforts to promote biking among the masses haven’t gone unnoticed. Some North Texans ditched their cars this morning. It was Bike to Work Day, one of the largest cycling events across the country. While North Texas isn’t well-known for being particularly bike friendly, many cyclists wanted to prove otherwise. There’s a class every month at the downtown Dallas Public Library that teaches people the ins and outs of bike-riding in North Texas. It’s called Bike Commuting 101, and it covers everything from bike gear and safety to state biking laws. This week, the cyclists prepared for Bike to Work Day on Friday. It's National Bike to Work Day, when commuters across North Texas are encouraged to get out of their cars and push their pedals. Despite the rain, some people took up the challenge. If you rode your bike Wednesday and wore a helmet, you won’t have to wear it Wednesday night. That’s because Dallas no longer requires every bike rider to wear one. The Dallas City Council voted 12-3 Wednesday to require only those 17 and under to wear a helmet. Right now, Dallas has a tough bicycle helmet law. Everyone must wear one. But the City Council is considering some pretty big changes that could be approved Wednesday. Today is National Bike to Work Day. It was a beautiful morning for a bike ride. Across North Texas, folks hopped on their bikes and headed to work. Here's a look at how people are marking the day. Fort Worth’s bike-sharing program is getting a boost from the Texas Transportation Commission: more than $500,000 to add 10 new bike-share stations. 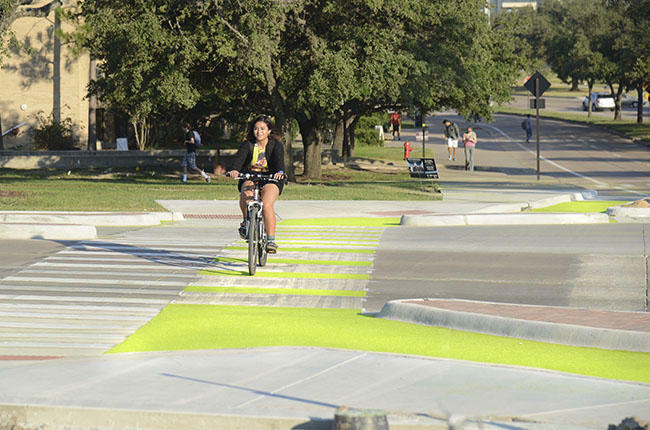 Dallas wants to create more than a thousand miles of bike lanes citywide in the next 10 years. Two big deals for Dallas bicyclists, known at City Hall as Vulnerable Road Users: After months of discussion, Dallas City Council committee members approved new rules of the road for shared bike lanes. And plans for dedicated bike lanes on Sylvan Avenue are up for discussion at a meeting tonight. The proposed Dallas bike lane ordinance may need more than some air in its tires to coast to a favorable vote at City Hall. The Dallas City Council is ready to spell out the rules of the road for the city’s new bike lanes. One of the shared lanes is on Main Street downtown. Dallas doesn't have on-street bike lanes. So it’s a stretch to imagine a day in the city without cars on the road. Bike Friendly Oak Cliff creates a version of that scene - on one bridge, for a few hours.